Get recipes for Mudardara (Mejadra), Lentil Meatballs With Lemon Pesto and Red Lentil Dal. 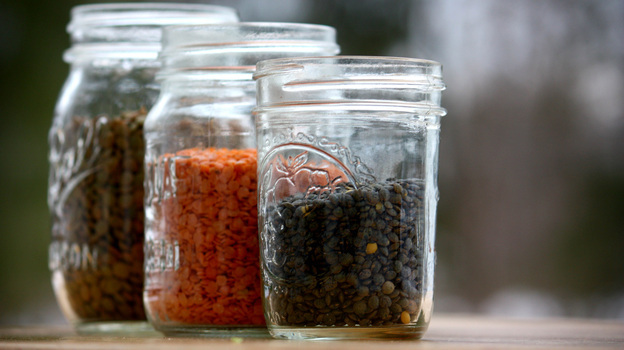 The year I discovered lentils, I was broke and lonely and didn’t know how to cook. Lentils, it turned out, would have gone a long way toward providing the solution to some of these problems. However, when I first had them, they were a mystery. They also were the cheapest thing on the menu at the Middle Eastern deli around the corner. The dish was mudardara, I was told. “What’s that again?” I said, unable to untangle the knot of plosive consonants. It was repeated. “ Like many another intrinsically boring foods — say, tofu or grits — lentils shine because they get out of the way. … They provide a sturdy, comforting stage for a colorful cast of characters, from chaste cumin to tart sumac, brilliant lemon zest to cool cucumber. I sat by the window, watching the rain trickle down the plate glass, and slowly ate what I couldn’t pronounce: the rice, the lentils, the caramelized onions. At the time, it seemed like the best food in the world — filling, nutty and earthen, the onions sweet and crisp on the edges. As I walked the block home, I muttered, “Muhdaahrderer, moojardarah, murdarjerer,” stumbling over the rolled “r” in the middle and wondering how I would go about ordering it the next time. I didn’t know then that mudardara is as common as can be — a staple found throughout the Arab world — and is spelled mejadra and mjaddarah among others. Though it’s thought to have originated in Persia, it’s eaten everywhere between Greece and India, from North Africa to the Black Sea. Even if you have almost nothing, you can probably scrape together a handful of rice and a handful of lentils, and if you can do that, you have mudardara. Like many other intrinsically boring foods — say, tofu or grits — lentils shine because they get out of the way. They provide a vehicle and a backdrop for other flavors — whether it’s good olive oil and gently gilded onions, or ground spices or minted yogurt. They provide a sturdy, comforting stage for a colorful cast of characters, from chaste cumin to tart sumac, brilliant lemon zest to cool cucumber. It took me awhile to learn my way around the understated charm of lentils. I started with soup, which was a cinch to make. Dry lentils were another story. Eventually, after many tooth-cracking undercooked lentils, I learned to pan-steam them with rice into the corner deli’s signature dish. I learned, too, that the flavor wasn’t magic. It was onions, as is usually the case. It’s said that Esau’s mess of potage — the one for which he sold his birthright — was an early variation of mudardara. If it had fried onions, then I think I know how he felt. Over the years, I have come to love lentils many different ways. I eat them in stews. I eat them seethed with bits of bacon or salt pork. I like them in cold salads. I especially like the red split lentils as a hot, spiced dal. I recently found a recipe that transforms them into “meatballs” — airy, nutty, meatless ones. Yet time and again, I return to that ancient blend of rice and legumes. It’s not that I would sell my birthright (whatever that might be — my father’s name? my mother’s good teeth?). But somehow, after eating my lentils, I always feel comfortably full, as if I could want for nothing. And if I can pass along to my children the know-how expressed in a dash of cumin, a handful of grains and a crisply dealt-with onion, surely that’s an inheritance worth a good deal more than a hill of beans. This entry was posted in Health by drnieman. Bookmark the permalink.